At 18:45 of the first period, Vladimir Tarasenko took a backhand pass from Brayden Schenn in the slot and snapped a shot past Rinne and St. Louis took a 2-0 lead. 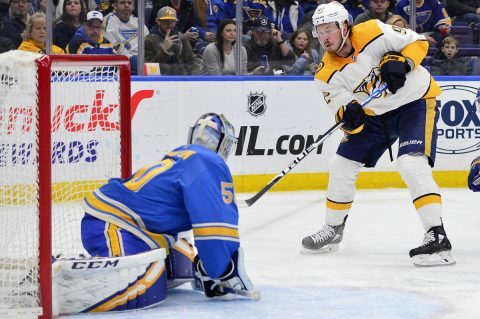 The Blues continued their offensive attack into the second period, but it was Mattias Ekholm who netted the Predators first goal of the afternoon. At 7:28 of the period, Ekholm fired a shot from a difficult angle just to the side of the net that bounced off of Jordan Bennington’s glove and into the net. Nashville trailed, 2-1. The Blues came right back at 10:58 as Mackenzie MacEachern grabbed a loose puck in front of the Predators net and slammed home the puck and St. Louis had their two goal lead back, 3-1. That’s how the second period ended. Into the third, the Predators stepped up their pressure, but couldn’t seem to crack Bennington in net. It wasn’t until late in the third and with an empty net that Nashville would give themselves a chance. At 18:45 of the final frame, Ryan Johansen whipped the puck off the the St. Louis post and into the net and suddenly it was a one goal game, 3-2. 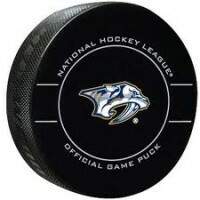 A controversial “no call” for icing late in the period failed to give Nashville the face off in the St. Louis end of the ice and the clock ran out on the Predators. Final score, 3-2. The two teams will travel to Nashville this afternoon and be set for a matinee game at the Bridgestone Arena tomorrow morning at 11:30. The Predators didn’t lose any ground on the division leading Winnipeg Jets who lost to Ottawa this afternoon, 5-2.